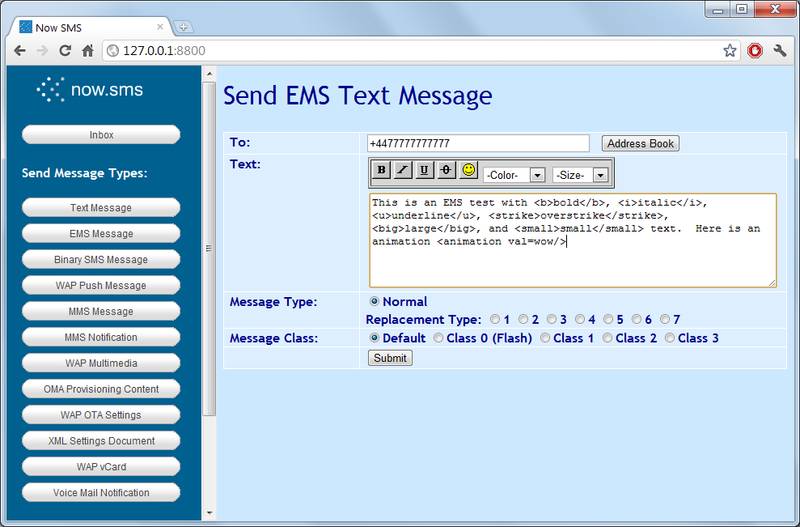 The Send EMS Message form contains some options to send some common types of EMS and Nokia Smart Messaging messages. The “EMS Text” option allows you to send text messages that include EMS attributes for text formatting, such as bold, italics and large or small text. EMS text messages can also included predefined animations and sounds which are pre-loaded on EMS compatible phones. NowSMS also supports generating the EMS text formatting codes to specify colors to be used in text messages, however this functionality does not appear to be very widely supported in current handsets. EMS Text messages are an interesting messaging option, because the EMS standard is designed in such a way that an EMS text message is gracefully downgraded when delivered to a recipient handset that does not support EMS. If the recipient handset does not understand EMS, it will display only the text of the message. 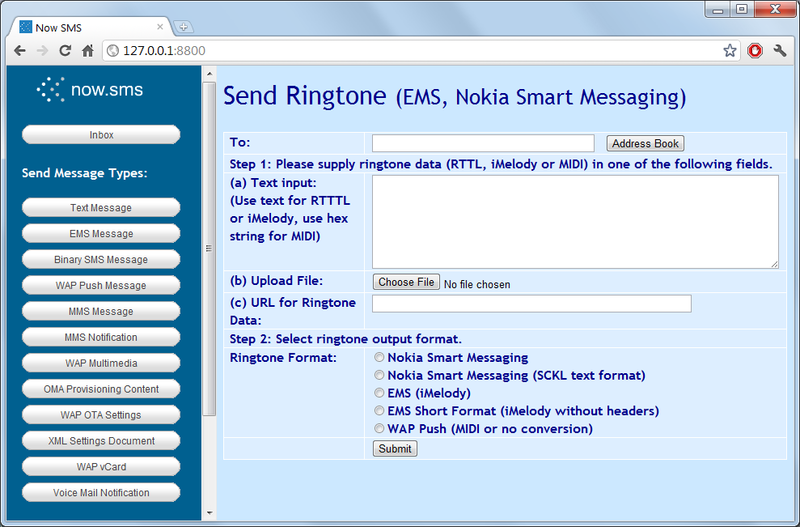 The “EMS ring tone” option allows you to submit ring tone data in either RTTTL, iMelody or MIDI format, and send the ring tone out in either EMS, Nokia Smart Messaging, or WAP Push/MIDI format. These formats are largely supported for the sake of interfacing with older or less capable handsets, as newer handsets often support true tone formats based upon MP3. 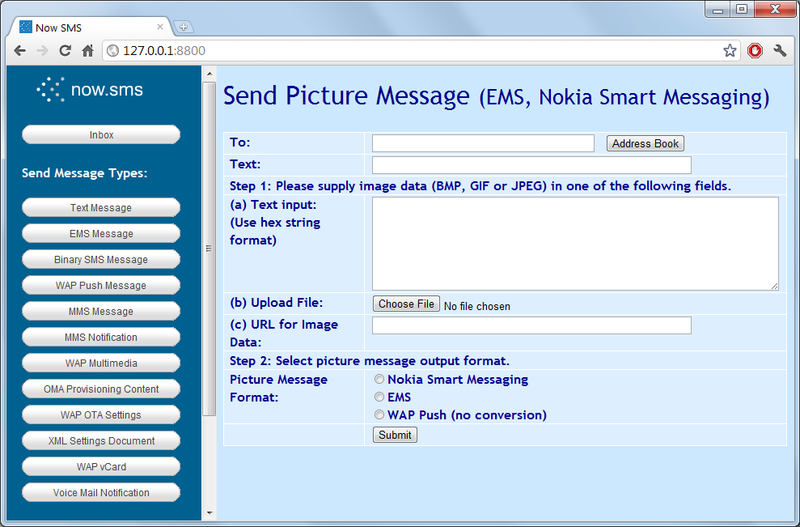 The “EMS Picture Message” option allows you to send simple picture messages using either the EMS or Nokia Smart Messaging format. These formats refer to the old monochrome/black & white images that are sent via SMS, as opposed to the more advanced functionality offered by MMS. While there is little use for monochrome images in a Technicolor world, these message types can be useful for applications that need to send bar code types of images via SMS, where they cannot assume that recipient devices will have MMS or WAP capabilities. The NowSMS web form includes a simple editor that inserts tags into the message which specify where text attributes should be changed, or where pre-defined animations should be inserted. Turns on or off the bold text attribute. NowSMS inserts <b> in the text to indicate the beginning of a bold section, and </b> to indicate the end. Turns on or off the italic text attribute. NowSMS inserts <i> in the text to indicate the beginning of an italic section, and </i> to indicate the end. Turns on or off the underline text attribute. NowSMS inserts <u> in the text to indicate the beginning of an underline section, and </u> to indicate the end. Turns on or off the overstrike text attribute. NowSMS inserts <strike> in the text to indicate the beginning of an overstrike section, and </strike> to indicate the end. 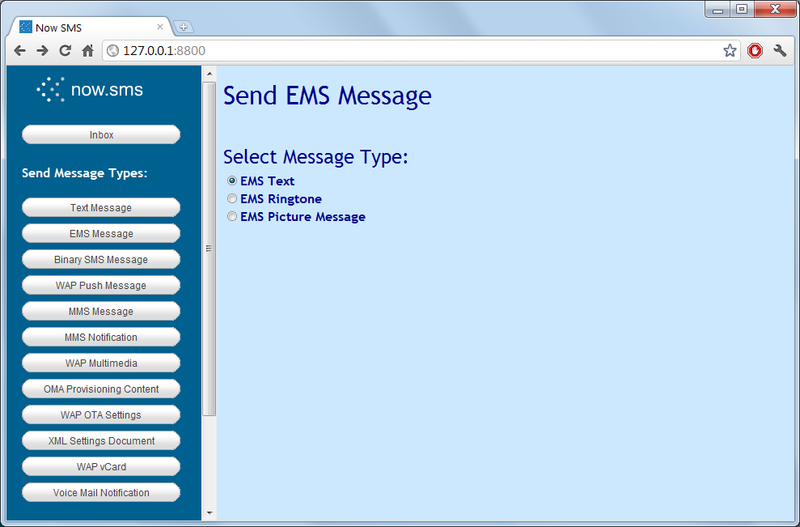 Displays a menu of pre-defined animations and sounds that can be inserted into the EMS message. These animations and sounds are defined as part of the EMS standard, and will vary slightly between different mobile phones. Animations defined in the EMS standard include: Flirty, Glad, Skeptical, Sad, Wow, Crying, Winking, Laughing, Indifferent, In Love, Confused, Tongue Out, Angry, Glasses, and Devilish. When an animation is inserted into the message, NowSMS inserts <animation val=xxxx/> to indicate the placement of the animation. xxxx is replaced with the name of the animation from the above list. Spaces are removed if present, for example <animation val=tongueout/> would indicate a placeholder for the “tongue out” animation. Sounds defined in the EMS standard include: Chimes high, Chimes low, Ding, Ta Da, Notify, Drum, Claps, Fan Fare, Chords high, and Chords low. When a sound is inserted into the message, NowSMS inserts <sound val=xxxx/> to indicate the placement of the animation. xxxx is replaced with the name of the sound from the above list. Spaces are removed if present, for example <sound val=tada/> would indicate a placeholder for the “ta da” sound. The “Color” drop-down allows an EMS text colour attribute to be specified. Colours supported in the EMS standard include: black, green, red, blue, yellow, purple (magenta), cyan, gray, and white. When a colour attribute is inserted into the message, NowSMS inserts <color val=xxxx> to indicate the beginning of the block of coloured text, and </color> to mark the end of a block of coloured text. xxxx can be any of the colours listed above, or it can be a numeric value between 0 and 15 to indicate a colour code as defined in the EMS specification. The “Size” drop-down allows attributes to be inserted to indicate small, normal, or large text. NowSMS inserts <small> to indicate the beginning of a section of small text, and </small> to mark the end of the section. NowSMS inserts <big> to indicate the beginning of a section of large text, and </big> to mark the end of the section. Normal text does not require an indicator. As an example, switching from large to small text would insert </large><small>, with </large> ending the large section of text, and <small> beginning the small section of text. Switching from large to normal text would insert </large>, with large ending the large section of text, implying that the text size returns to normal. To send a ring tone, you need to supply ring tone data. Ring tone data can be submitted either as text input, as a file to be uploaded, or via an http:// URL reference to a file that resides on a separate web server. The ring tone data must be in RTTTL, iMelody or MIDI format. Now Mobile does not provide technical support on the creation or deployment of ring tone services. The limited conversion options provided in the NowSMS web interface are intended as a convenience. While NowSMS may be used for the delivery of ring tone content, we strongly recommend that you evaluate other software packages to aid in the creation and conversion of ring tones. Now Mobile also does not provide technical support or guidance regarding which ring tone formats are supported by which mobile phone models. Ring tone delivery can be a complex business, and the NowSMS product is focused on message delivery, not ring tone authoring. 3.) MIDI is a slightly more capable ring tone format which uses a binary file format instead of a text format. While it is possible to convert a small MIDI file into a text string of hex characters, more commonly, a MIDI file would either be uploaded to the NowSMS server, or referenced via URL from another web server. 4.) It is also possible to use this web form to send ring tones of other formats out via a WAP Multimedia Message. When a ring tone file in a format other than RTTTL, iMelody or MIDI is sent via this web form, it cannot be submitted as text input, and needs to be submitted as a file to be uploaded, or via an http:// URL reference to a file that resides on a separate web server. In this case, the output ring tone format must be “WAP Push”, and NowSMS will send the ring tone out via WAP Multimedia Push without performing any conversion of the ring tone data. 2.) EMS (iMelody) – The ring tone is converted to iMelody, if necessary, and encoded as an EMS message. 3.) EMS Short Format (iMelody without headers) – The ring tone is converted to iMelody, if necessary. As EMS can be rather verbose, the headers are stripped from the iMelody data, and it is then encoded as an EMS message. EMS iMelody messages are typically larger than Nokia Smart Messaging encodings because of the verbose iMelody headers. It is therefore more likely that a longer melody will be forced to span multiple SMS messages. Many EMS compatible phones do not support melodies that span multiple SMS messages, requiring the use of the EMS Short Format to attempt to fit the ring tone into a single message. 4.) WAP Push (MIDI or no conversion) – If the input ring tone is in RTTTL or iMelody format, it is converted to MIDI. Otherwise, no conversion is performed. The output ring tone is delivered as a WAP Multimedia Message. To send a picture message , you need to supply picture or image data. Image data can be submitted either as text input, as a file to be uploaded, or via an http:// URL reference to a file that resides on a separate web server. The image data must be in BMP, GIF or JPEG format. (To input a BMP, GIF or JPEG image as a text string, it must be converted to a text string of hex characters where each binary byte of the image is represented as two hex characters. File upload or referencing a web server URL that contains the image is usually easier.) Input images should have a width in pixels that is a multiple of 8. Keep in mind that images sent via this interface that are to be converted to Nokia Smart Messaging or EMS message should be kept small in size. For larger images, use MMS.